One of my favourite countries in the world is Australia, and one of my favourite parts of Australia is Western Australia. I love Perth with its stunning beaches, vibrant city, Rottnest Island and Fremantle, and have such happy memories of our time there. Sally Ann Brown lives in Perth, and runs the fantastic Toddlers on Tour website, which provides excellent advice about travelling with children. She has written this fantastic article about things to do in Western Australia with babies and toddlers. Having read this I really want to go again and take my little ones! After flying 24 hours with a baby or toddler (which can’t have been overly fun) you have finally arrived into Perth, the capital of Western Australia (WA). A state that is the second largest in the world covering a total of 2,529,875 km2 and you’re wondering “what to do?” With the choice of white sandy beaches, stunning rocky landscapes, carpets of pretty wildflowers, world class food and wine regions plus colonial history to explore, where do you start? Whilst the North West has spectacular natural landscapes and hiking trails, it is really geared up for couples and families with tweens and teens, and you’ve arrived with a baby or toddler. So aim to stay in the South West where you can enjoy the Mediterranean climate. One of the great things you will find when you visit WA with a baby or toddler is how easy it is to get about with a pram. Due to our laws, public facilities need to be wheelchair accessible – that means it’s pram accessible; you will be able to get about with ease. Plus shopping centres and attractions all provide parent rooms and/or changing facilities. So let’s look at some great places to visit with a baby or toddler. 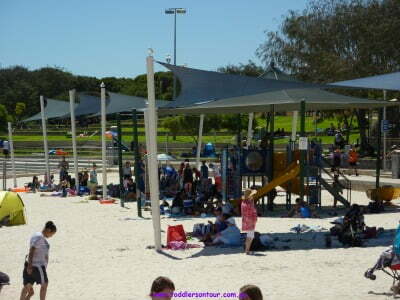 Hilarys Marina Beach is an absolute favourite for Perth families with young babies and toddlers. From the free car park you can push your pram into the marina and stroll along the boardwalk surrounding the beach. Find a spot on the white sand under the shade sails by the toddler playground. When you’re ready for a cool down take the kids to the waters’ edge. As the beach is protected by the marina there are no waves to knock over little ones and the gradient of the water’s sandy bottom is so gradual that your toddler can paddle in for quite a way. We took our son to an underwater aquarium as a toddler and he just loved it. AQWA is located just outside Hillarys Marina. This underwater aquarium allows you to explore the entire West Australian coastline consisting of over 4000 fish. Plus your toddlers may love the experience of the touch pool. Again this attraction is easy to navigate with a pram. 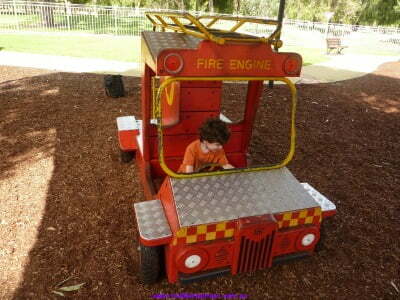 Whiteman Park is a great park to enjoy a family picnic. There are free BBQs, playgrounds and a paddling pool. Explore the park on historic public transport, take the family on a tram ride ($5 adults, $2.50 for kids), a train ride ($8 for adults, $6 kids 6-12yrs and $2 for toddlers), or a vintage bus tour around the park (free). There are several museums in the park the young ones are sure to enjoy: the tractor museum (free), transport museum (free), and the motor museum ($10 adults, $7 Kids) with a final stop at the Lolly Shop. No trip to Australia would be complete without seeing our native wildlife. The Caversham Wildlife Park is located within Whiteman Park and your little ones will get the opportunity to get up close with the native Australian wildlife. They will be able to pat, feed and have photos taken with the kangaroos, wallabies, koalas and wombats. Plus there are many more Australian native animals to check out including emus, lizards, echidnas, dingos and crocodiles. The kids may also enjoy the farm show with whip cracking, sheep shearing and sheep dogs mustering. 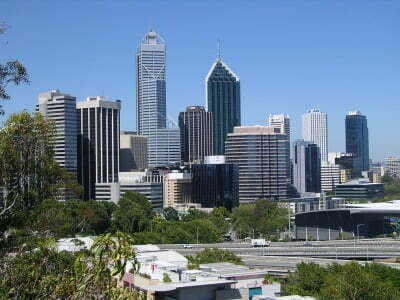 The South West has been a popular holiday spot for West Australians for generations. With the highway being recently upgraded it is now just a 2 and half hour drive south of Perth. The kids can bottle feed the lambs or pat and feed the llamas, rabbits, guinea pigs, alpacas, goats at Wonky Windmill Farm ; a bag of food is included with your entrance. The helpful fact boards help to answer any questions your kids may have about the animals and farm life. Take a picnic so the kids can enjoy cuddling the animals at leisure. Then visit the orchard and pick some fruit ($4/kg). 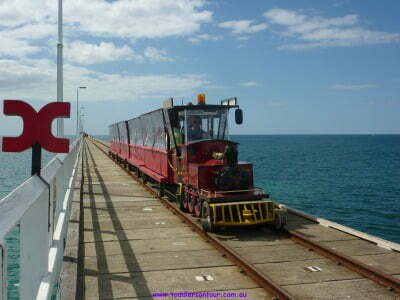 The Busselton Jetty is the longest wooden bridge in the southern hemisphere. You can stroll down the 1.8 km out into Geographe Bay reading the about the history of the jetty and watching fisherman along the way. But to be honest the kids are really going to love going for a ride on the train. Go down into the observatory and check out the 300 species of marine life that live beneath the jetty. The caves have always been a favourite of mine since I was a little girl when my parents took me. Particularly Jewel cave with its beautiful crystals cavities. However there are choice of 4 caves to visit in the South West, though only one has disabled access which is Mammoth cave. This cave has a boardwalk where you can see ancient fossils, megafauna and whistling birds. Jewel and Lake Caves both have stairs so if you brought a baby carrier or willing to hold your toddlers hand you may like to see their stalagmites, stalactites with their unique crystals and interior lakes. One of the main attractions to the South West is the wine, with its perfect conditions for growing grapes it has become a world class wine region. 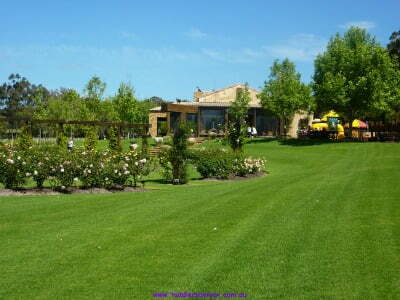 In my pre children days I spent many getaways in this region, however with a baby boom beginning in 2008 the wineries have had to make some adjustments for their clientele and many wineries now have become toddler friendly. They provide small playgrounds or indoor activities so you can sample the wine or even stop to have a beautiful lunch while the kids play. Get the kids trying some new foods or offer a stop at one of these as a reward for being good on a day trip. Our family favourites include: Margaret River Chocolate Factory, Providore, Simmos Ice-cream, The Berry Farm or Margaret River Diary. 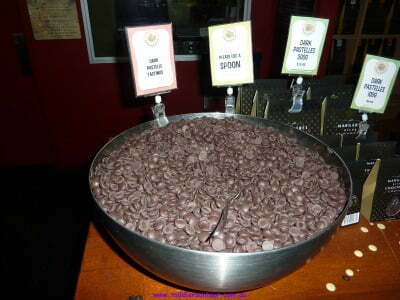 Some of these places also have a playground for the kids so that you can really enjoy all the tastings. Sally-Ann Brown is the author of Toddlers on Tour. She is a wife, a mother and a blogger who has always had a passion to travel. She loves sharing her tips and advice for travel with kids and travel lessons learned, to help you have a better family holiday. The western part of Australia has an outstanding beauty, Jo! Great you shared this story and travel guide with us!